Barley is a great source of dietary fiber and actually contains both soluble and insoluble fiber. It contains important vitamins, minerals and is low in fat. According to barleyfoods -Barley is an excellent food choice for those concerned about type 2 diabetes or pre-diabetes because the grain contains essential vitamins and minerals and is an excellent source of dietary fiber, particularly beta-glucan soluble fiber. Research shows that barley beta-glucan soluble fiber promotes healthy blood sugar by slowing glucose absorption. The vitamin C content in barley is almost twice than that of oranges. This vitamin particularly strengthens your immune system and reduces the chances of cold and flu. Barley is said to reduce the risk of osteoporosis, prevents heart diseases and some forms of cancer. Many of us do not use barley in our cooking regularly. I used to make barley soup once in a while but have not combined it with dal. I adapted this recipe from Tarla Dalal's Diabetic recipes book. This is a very nourishing soup with the goodness of vegetables. It is rich source of fiber, iron and protein. Though I have named it diabetic recipe, anyone can have this soup. I had this for dinner along with whole wheat bread. It was very tasty and also filling. 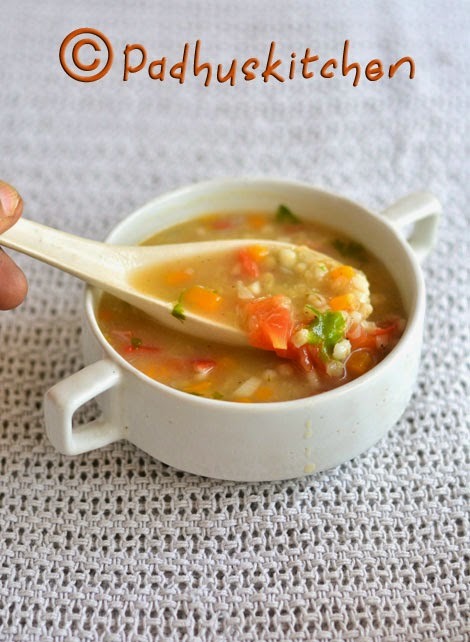 Today we will learn how to make barley soup with vegetables following this easy recipe. Wash and soak barley overnight. Chop all the vegetables finely. Heat oil in a pressure cooker, add onions, garlic and saute until onions turn transparent. Add washed dal, barley, chopped carrots, salt needed, 3-3 1/2 cups of water and pressure cook for 3-4 whistles. Once the pressure subsides, open the cooker, mash the contents slightly, add finely chopped tomatoes, coriander leaves and pepper powder to taste. Serve hot with garlic bread or whole wheat bread. Note - you can use homemade vegetable stock instead of water. You can add more vegetables if preferred. Hello Padhu, excellent blog you have here. By the way sautéed mushrooms are a great addition to any barley dish. I tried his recipe it’s very nice and filling.can you please post more of these kind?�� Thank you ! You can add moong dal (pasi paruppu).